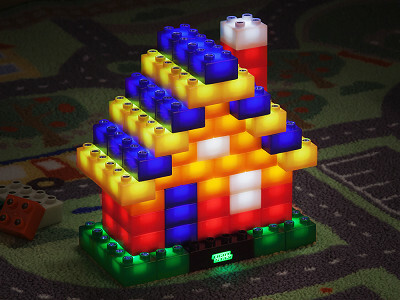 Light Stax are the new building blocks on the block—they glow via internal LEDs. 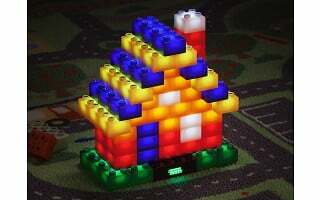 Build a structure on the electric-powered base, and each block you add lights up. The result will be a multicolored statue of light that can blink, fade, or stay steadily illuminated. Inventor Johnny Lin got the idea for Light Stax while at a toy fair in China. He saw plenty of building block systems and LED-based toys but no combination of the two. A light went on (so to speak), and five years of development later, Light Stax was born. Johnny is now an award-winning toy designer. For kids, Light Stax is a bold way to play creatively. They can build a self-dimming nightlight. Or mix and match with Duplo blocks. As long as the Light Stax bricks remain in sequence, they’ll light up. And if you’d rather play with Light Stax yourself, they make a standout addition to an office desk. When it comes to these building blocks, there’s no age limit. Hello everyone! I'm proud to introduce Light Stax to The Grommet. I'd be happy to answer any questions you have! I am assuming that if they fit with Duplo blocks, they are too big for Lego blocks. Is that correct or am I picturing Duplo's wrong? If they don't fit with Legos, any chance of any coming out that do? @Marianne Thanks for asking! Yes, Light Stax are the same size as the larger type bricks. However, a little known fact is that Duplo and regular LEGO bricks do fit together. That being said, look for Light Stax to announce some new developments early next year. @Kenneth -Wonderful!! My Grandson (age 5) is a huge fan of Legos but is beyond Duplos. so this is good news as he will absolutely love these! Christmas shopping will be done very soon!! Thank you! I will watch for the new developments, so maybe his birthday will be easy too! Gifting made easy, Marianne! It's what we do best here at The Grommet! These look awesome! I am thinking of ordering some for a 5 year old for Christmas. @Nora Thanks so much for your encouragement! I'm sure they will enjoy these. does this toy have a suggested age range, i.e. 3+ years? @philena Yes, Light Stax are safe and fun for ages 3 and up. hi kenneth good for a 10 year old or would he be too old? @ellyn At that age, it really depends on the child. While the larger brick size tends towards younger kids, the LED lighting effects are still pretty intriguing for older ones. Is he really into custom LEGO builds or Minecraft? If so, he will probably enjoy Light Stax. Thanks for the great invention!!! @Mso Currently, the bases are not sold separately in the US. We've had a few people ask about it, so we will work on making that available in the future. Thanks for the suggestion! So, Kenneth, I have a whole bin full of various Lego sets from the early 90's. How can they work? Do you have to put one of the light up blocks in between every so many of the Lego blocks to get them to light up? Or what? I have kept these blocks from when my kid's were young because there are so many neat and unique pieces that I consider them vintage! Plus I refuse to give them away because they are part of my children's childhood and I still like playing with them myself with my grandchild. Will one small starter kit enable you to build a large structure and have it light up? Or do you need more than one. And what enables the connection going? Jewels. @Julie The Light Stax blocks have electrical connectors built into each stud. So as you connect one Light Stax to another, it creates a circuit allowing each block to light up. 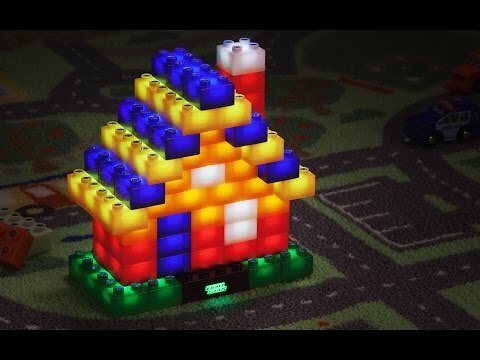 When using Light Stax together with traditional toy bricks, you have to think creatively by designing a way for the circuit to reach each Light Stax. So you end up using Light Stax to build around, over, under, or through the regular brick structures. Think of Light Stax as being complementary to your existing bricks. So if I built a flat square that was completely constructed out of Light Stax blocks and filled it in with regular blocks would they all light up? Jewels. @Julie Light Stax will not make regular bricks light up. Just the Light Stax bricks themselves will illuminate. But you can make, for example, a lighthouse with regular bricks and use Light Stax at the top to make part of your creation light up. @Marcia Light Stax is powered by 3 x AAA batteries in the power base, or via any USB power source (iPhone charger, etc) using the included USB power cable.